I found this on a site that sells posters (allposters.com), with no accompanying information aside from the caption. I was always of the impression that African elephants couldn't be tamed. So I did a little surfing. For many years the Belgian government has maintained a training station for elephants at Wanda [, Belgian Congo]. From the wild herds that roam in the surrounding forests, they capture young animals and these are brought to the post for a course in discipline. They are then sold to plantations or to the missions. The African animal is quite different from the Indian species, a much harder beast to domesticate, never becoming entirely docile. 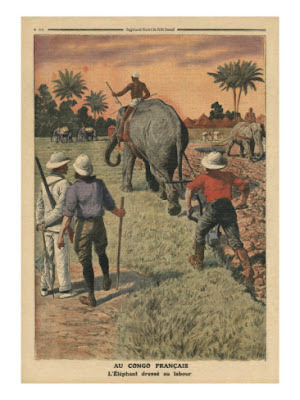 Until the Belgians undertook this work, it was thought impossible to train the African elephant. They have succeeded to a certain extent, but the results obtained are small considering the amount effort and time expended, and it is not likely that this animal will ever become a great aid to mankind, comparable to his Indian cousin. And here's a little more information about the station, with a grainy black and white video of the elephants.